Many accredited institutions have developed quality online Information Technology degree programs for the aspiring IT expert that are designed to give the knowledge and skill set needed for a successful career in the field of technology. With a tremendous increase in demand for qualified IT professionals due to the constant evolution of technology, the availability of jobs in a vast variety of disciplines and concentrations is on the increase as well. An online IT degree is a great first step to working in fun and dynamic environments ranging from small organizations to large firms, in the private sector or for government. Whatever the setting, tech-savvy individuals with IT degrees are in demand everywhere. The University of Nebraska, Omaha is one of the top colleges where you can pursue an online information technology degree with a best value ranking. Through its Bachelor of Science in Management Information Systems (BIS), students learn how to use their knowledge in computers to make running of businesses or companies more efficient. Students are required to complete 120 credit hours in order to graduate. The final 36 must be completed at the university. They will cover courses such as Web Development, Introduction to Information Security, Introduction to Computer Programming, Business Data Communication, Information System Analysis, Database Management and System Design & Implementation. Another bachelor’s program is the Information Assurance where students learn the design, implementation and management of secure information systems. They are required to complete 27 credit hours in Information Assurance core courses. Apart from the bachelor’s programs, the university also offers the Master’s in Information Assurance and a Ph.D. in Information Technology. The Ph.D. program prepares individuals so that they can teach at colleges and universities. They will also have a deeper understanding in development and implementation of technologies. The university is accredited by the North Central Association (NCA) of Colleges and Schools. Oregon Tech Online is a right choice of college for online information technology degrees. The program is suitable for everyone, from working professionals who’d like to add to their knowledge, to freshly graduated high school students. The program explores important areas such as systems administration, systems analysis, PC hardware and software, database programming, project management, applications development, finance, principles of accounting and network systems. Students are required to complete 60 credits of upper division coursework prior to graduating. The tuition rate for a credit hour is $227. Oregon Tech Online is recognized for its efforts and performance. It ranked no.1 in the “Top Public West Regional Colleges” category by U.S. News & World Report. It also ranked no. 11 in the annual “College Return on Investment” Report by PayScale. The school is accredited by the Northwest Commission on Colleges and Universities (NWCCU) to award undergraduate degrees. Trident University returned a high score for colleges offering online information technology degree programs to be among the top. At the Bachelors level, Trident University International offers a Bachelor of Science in Information Technology Management that is designed for IT professionals who want to meet their academic goals despite their busy lifestyles. The program prepares students for fulfilling careers in government, private and non-profit organizations. At the end of the program students will have gained a proper foundation on the management of information systems and will have understood some of the managerial applications of technical issues. The program requires 120 credits for the degree to be completed. Trident university offers the following IT management concentrations: Information Security, Business Systems Analysis and IT Project Management. With these options, students will be prepared for careers such as an information security analyst. For students at the master’s level, the university offers a Master of Science in Information Technology Management with concentrations in IT Project Management, Information Security/ Assurance and Digital Forensics, and IT Systems Analysis and Design. 1. University of Southern California. Ranked #1 by U.S News and World Report among the Best Online Information Technology Colleges, this private university offers online, graduate-level, information technology programs. These include courses in 3D Animation, Introductory, Entrepreneurship, Mobile, Multimedia, SAP Programming, Security/Forensics, Video Game, Web Development and System Administration. Specialization opportunities are available such as in Cyber Security, 3D Animation and Special Effects, Computer Programming, Digital Forensics, Enterprise Information Systems Specialization using SAB, Video Game Production, Mobile App Development, Video Game Programming and Web Development. Tuition is offered per credit at $1706 regardless of residency status. The University is ranked as having among the Best Online Graduate Computer Information Technology Programs by the U.S News and World Report. The university offers a combined degree and certificate program that is offered through collaboration between Virginia Tech’s College of Engineering and the Pamplin College of Business. The program includes seven related IT modules which are; Health Information Systems, Software Development, Information Security, Business Information Systems, Decision Support Systems, Networking and Telecommunications. Tuition is offered at a per credit hour cost of $900 and does not depend on residency. Ranked #3 among the Best Online Computer Information Technology programs, this university offers quality degree and certificate programs that are certified by the Committee on National Security Systems. It offers a Master of Science in programs such as Computer Information Systems. This features concentrations in Data Analytics, Computer Networks, Database Management and Business Intelligence, IT project management, Health Informatics, Security and Web Application Development. It also offers a Graduate Certificate in Information Technology and another graduate certificate in Information Technology Project Management. The cost per credit for tuition is $800 and is the same for both in-state and out of state students. 4. Pennsylvania State University – World Campus. This critically acclaimed university is ranked #4 by the U.S News and World report among the Best Online Information Technology Programs. It offers both undergraduate and graduate degrees online. Its online programs include an Online Bachelor of Science in Information Science and Technology, an Undergraduate certificate in Information Sciences and Technology and an Associate in Science in Information Sciences and Technology. Tuition costs $784 per credit hour and is the same for both residents and non-residents. This university, through the Whitings school of Engineering, offers Information Systems Engineering with special focus areas in Software Engineering, Systems Engineering, Cyber Security, Network Engineering, Enterprise and Web Computing, Information Management and Human Computer Interaction. 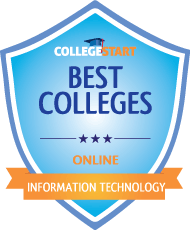 The university is ranked among the Best Online Information Technology Colleges by the U.S News and World Report. Tuition costs $1,177 per credit and is the same for both in-state and out of state students. The Northeastern university offers a Bachelor of Science in Information Technology completely online. This rigorous online program provides students with a solid foundation in the methods and principles of Information Technology. Completely suited to an online format, this degree program prepares students for careers in web and multimedia design, networking, system and network administration, and security. Ideally suited to an online format, the program includes coursework on computer programming and technology, database management, examining quantitative methods, network and internet essentials and operating systems. Students thus gain the necessary knowledge in information technology that can be applied across a variety of systems and settings. With over four core courses and numerous electives, students are equipped to specialize in areas such as database technologies, applications development, computer information infrastructure and many other specializations. Tuition costs $378 per credit hour. Also, financial aid is available through loans, federal grants and scholarships. Accredited by the Commission on Colleges of the Southern Association of Colleges and Schools, East Carolina University offers an online Bachelor of Science in Information Technology. Using the same world-class faculty online as on campus, students receive the hands-on skills required for a career in information technology. Some of the key courses studied for this program include: installation and maintenance, computer network and network security and intrusion detection among others. These courses prepares students for certifications. Some of the career options available to students of this degree program include: hardware and software support, office management, desktop publishing, systems management as well as website development. Students are prepared for future careers through work experience and internships available from some of the institution’s partners such as Oracle. Tuition costs $156.45 per semester hour for residents and $682.60 per semester hour for non-residents. Financial aid is available in the form of grants, student loans and scholarships based on need. Ranked among the Best Online Bachelors Programs by the U.S News and World Report, the information technology program at Lawrence University is a highly technical, current and industry relevant bachelor’s program. It is a degree completion program. This means that to be eligible to enroll, one must have an associates level degree. The coursework explores a variety of key topics such as: Database design, project management, systems analysis, information systems management, telecommunications and many more. Students are thus able to specialize in systems design, software applications or infrastructure. The entire curriculum consists of 27 credits of focused electives and another 15 credits of general electives. Tuition costs $600 per credit hour with financial aid available to needy students. The Information Technology degree program at DePaul University prepares its students to meet market needs by helping them acquire knowledge in software configuration. The program instills other skills in its graduates that allows them to select, create, apply, integrate and administer computing technology. In addition to that, students become skilled in problem solving, networks and Communications systems, programming, databases, security and project management, and internet and web technologies. Students gain hands-on experience from internships and working with industry professionals. This program is available entirely online and tuition costs $188 per credit hour. Accredited by the Higher Learning Commission of the North Central Association of Colleges and Schools, the Colorado State University offers a quality information technology degree that is available fully online. Students thus become proficient in new and innovative technologies. Technical skills in technology troubleshooting and programming, allow graduates to meet the software and hardware needs of individuals and organizations. Some of the concentrations and specializations available are in cyber security and data management analysis. Moreover, this degree program is very affordable with low rates, no non-resident tuition and a tuition guarantee for all enrolled students. The tuition guarantee policy ensures that once a student enrolls, tuition will remain the same throughout the entire program. Current tuition costs per credit hour stand at $350. Several financial aid options exist, and special consideration is given to military students as the school is military friendly. Elmhurst College is accredited by the Higher Learning Commission of the North Central Association of Colleges and Schools. It offers a bachelor of science in information technology that is available in two formats; 100% online or a hybrid program. With an acceleration option, one can earn a degree in as early as 14 months. Some of the concentrations available include: digital cinema, cyber security, computer information systems, geographic information systems and software development. Tuition costs $575 per credit hour online and is the same for both resident students and non-resident student. Financial aid is available in the form of grants, student loans and scholarship opportunities. Designed for aspiring professionals in the field of network technology, the information technology program available at the Ohio university offers computer skills that are industry relevant. The Ohio university, is accredited by the higher learning commission of the North Central Association of Colleges and Schools. Earners of this degree are eligible for careers in programming, software development and applications development. Tuition costs $243 per credit hour with the availability of numerous financial aid options such as student loans and federal grants and scholarships. 13. University of Nebraska at Omaha. The online Bachelor of Science in Information Technology degree at the University of Nebraska at Omaha is fully accredited by the Computing Accreditation Commission of ABET. It delivers the necessary computer related skills through an agile and flexible approach that allows it to evolve in response to changing technologies. Students, in collaboration with faculty, conduct research in language systems, software development, data mining, robotics and high-performance computing. Also, students get to gain experience from the many internship opportunities available within the Omaha community. Some of the career opportunities available to holders of this degree include: programmers, software developers, application developers and artificial intelligence specialists. With a variety of inter-disciplinary courses, the program takes an integrated undergraduate-graduate program that allows students to complete both a bachelor’s and a master’s in five years. Tuition costs $250 per credit hour. In addition, financial aid is available through scholarships, student loans and grants. 14. Keiser University – Ft Lauderdale. Keiser University – Ft Lauderdale, is accredited by the Commission on Colleges of the Southern Association of Colleges and Schools. It has a robust and adaptive online information technology degree program that aims to: shed light on the business aspect of technology, develop written and spoken communication skills and educate students in the fundamental business principles applicable to the management of information technology. It is a completion program that requires an associate’s level degree as a prerequisite for admission. The online student requires 60 upper division credits to earn the degree. The program prepares computer technicians for roles as information technology professionals, managers and supervisors. Tuition costs $440 per credit hour. Financial aid is also available in the form of student grants, student loans and scholarships based on need. The Central Washington University is accredited by the North West Commission on Colleges and Universities. Ranked #194 among the best online bachelor’s programs by the U.s News and World Report, the Central Washington University offers two information technology programs. These two information technology programs are as follows: a Bachelor of science in information technology and administrative management and a bachelor of applied science in information technology and administrative management. The Bachelor of science program allows for various specializations in key areas such as: cyber security, administrative management and retail management and technology. On the other hand, the bachelor of applied science program allows for specializations in administrative management, information technology or cyber security. The cost of tuition is $265 per credit hour. Financial aid is available to students based on need. 16. University of West Florida. The University of West Florida offers a bachelor of science in information technology degree program entirely online. It receives its regional accreditation from the Commission on Colleges of the Southern Association of Colleges and Schools. The information technology program consists of three specializations in information technology, networking and Communications, and digital enterprise. It offers a firm and solid foundation in the principles of programming, database concepts and topics in information technology. Learners thus gain the necessary skills required for positions as application support analysts, business requirements analysts, operations managers, infrastructure managers, database analysts, project managers, network managers, web architects, systems architects and information technology managers/directors of information technology. The program is offered fully online through the blackboard and TurnItIn platforms. The cost of tuition is $218 per credit hour. The information technology degree program offered by the New Mexico University is ranked among the best online bachelor’s programs by the U.S News and World Report. In addition to that, the New Mexico University is a fully accredited university with its regional accreditation from the higher learning commission of the north central association of colleges and schools. This web-based program allows students to explore key concepts and topics that are related to information technology and are required for the design, implementation and management of a wide variety of computer-based information systems. The program curriculum involves the study of computer hardware, system integrations, application and operating systems software, database design and database management, network security and networking. This ensures that students are adequately prepared for careers as information technologists, project managers, database administrators, systems administrators, network administrators and computer support specialists. The course consists of 42 credits that include 14 upper division information technology courses. As the program is a degree completion program, in order to enroll students must either have an associate degree or 62 credits. The tuition costs for the program are $248 per credit hour. Being a fully accredited university with its regional accreditation from the commission on colleges of the southern association of colleges and schools, the Western Kentucky University offers an online information technology degree at the bachelor’s level. Moreover, it is ranked among the top three best online bachelor degree programs by the U.S News and World Report. Offered 100% online, the coursework for this degree program consists of 120 credit hours with 60 hours of upper-level computer information technology coursework. Career opportunities available from the study of this program include network architecture, network engineering, systems administration, database administration, computer security specialists and web development. The tuition cost for this program is $381 per credit hour regardless of status of residence. The Columbus State University is fully and regionally accredited by the Commission on Colleges of the Southern Association of Colleges and Schools. It offers an information technology degree program through the D.Abbott Turner College of Business. It is offered fully online. The well-rounded curriculum covers essential skills in science, humanities, math and technology. Students earn 123 credit hours on completion of the program. The tuition costs $169 per credit hour. Being a fully accredited university with its regional accreditation from the Commission on Colleges of the Southern Association of Colleges and Schools, the Kennesaw State University offers an information technology degree program that is accredited by the Computing Accreditation Commission of ABET. It is delivered on three platforms; completely online, on-campus or hybrid. The program comprehensively covers information technology infrastructure, planning, development and maintenance of computer hardware and software systems. The cost of tuition is $270 per credit hour. The information technology degree program at the Kings University is designed for professionals in information technology related management and administrative careers. It equips learners with the tech savvy skills that enable preparation for a variety of technical career options which require communication skills, business skills and critical thinking skills. With concentrations in programming, cyber security and network management, graduates are fully equipped to assist individuals and organizations to meet their technology needs, goals and objectives. The curriculum consists of 12 courses that make up 48 semester hours. A total of 124 semester hours are required to graduate. Tuition costs $300 per credit hour. The Hodges University is fully accredited and has its regional accreditation from the commission on colleges of the southern association of colleges and schools. It offers an online information technology degree that can be delivered either completely online or through a self-paced online program called Utrack. This quality degree program prepares learners to develop and support a variety of information technology systems. It offers a selection between a network and software track with key focus areas in a variety of technological and information systems. Moreover, the program gives a solid foundation in theoretical and practical aspects of business as well as a foundation in liberal arts. Also, students are provided with numerous opportunities to earn certificates that are widely recognized within the information technology industry. It also allows students to apply their knowledge in every workforce sector with options such as: database systems, forensics, information security, networking, web design and development and software development. Students also get practical skills and a working knowledge of widely used office application packages, website design techniques, database management tools, networking and hardware essentials and programming. The cost of tuition is $530 per credit hour. The Western Governors University is accredited by the North west Commission on Colleges and universities. It offers an online information technology degree that provides students with a solid foundation for skills and knowledge required for information technology studies. The program is offered fully online and is flexible to adapt to the schedules of working professionals. With a total of 120 competency units, key subject areas include information technology, web development, fundamentals, network and security, technical writing, leadership and management, operating systems, scripting and programming, business of information technology and data management. In addition to that, in order to complete the degree, each student is required to complete his/her capstone project which is a culmination of the students hard work and learning applied to find the solution to a real world problem. Tuition rates per semester stand at $2890. Financial aid is available in the form of scholarships and an institutional partners fund of $2000. The Granite State College is a public university that is accredited by the Commission on Institutions of Higher Education of the New England Association of Schools and Colleges. It is also ranked among the best online bachelor programs by the U.S News and World Report. The degree program comes in two flexible formats; an online format and a hybrid format. Students acquire the knowledge to build a foundation in programming and technology and with the skills acquired, students can operate across key organizations, domains and levels including operating systems, database management, networks and internet essentials. Also, students are encouraged to explore online infrastructure and database management. Some of the specializations available include programming and technology management. This degree program prepares students for careers in fields such as: computer networks, information technology administration, systems administration, database administration, lead system development, information services management and network administration. With the skills acquired, degree holders are able to assess the needs of technology users and come up with appropriate strategies to address these needs. Bellevue University is accredited by the Higher Learning Commission of the North Central Association of Colleges and Schools. It offers a bachelor of science degree in information technology that can be delivered entirely online. With it, students gain the necessary skills for the installation, configuration and troubleshooting of computer systems for success in business operations. The students are provided with foundational information technology skills that allow for the exploration of the fundamentals of networks, servers and cloud environments. Students become skilled in the best practices required to install, configure and upgrade personal computers and operating systems and other information technology skills such as the implementation of policies and standards for local and cloud server environments. This program propels students to eligibility for a variety of careers such as: help desk technicians, system administrators, network administrators, hardware support technicians and software support technicians. The curriculum involves numerous elective courses and a required 36 credit hours. The information technology degree offered at Peirce college is entirely online and gives students two options. Students can study for a Bachelor of Science in Technology Management or a Bachelor of Science in Information Technology. It is ranked among the top 100 best online bachelor programs by the U.S News and World Report. The courses combine soft skills, theory and cutting edge practical skills that aid learners in the selection, design, integration, implementation, evaluation and administration of computer-based systems to meet the needs of individual computer users and organizations. Other skills developed during the course of the course can be applied for careers in network design, network maintenance, systems analysis, web administration, web security, applications development and programming. Tuition costs $550 per credit hour online. Franklin university is a fully accredited university that is ranked among the top 100 best online programs by the U.S News and World Report. It receives its regional accreditation from the Higher Learning Commission of the North Central Association of Colleges and Schools. It offers a bachelor of science degree in information technology with a well-rounded curriculum that covers topics such as: infrastructure management, information security and database administration. Described as a course that pairs “challenge with reward,” students are able to apply the knowledge they gain in a variety of sectors; from applications to security to infrastructure. Therefore, this degree program suits a wide range of career paths. Students gain well rounded and mission-critical skills that become relevant in network and system administration, information technology project management, infrastructure management, information security and database administration. Students become employable in many fields such as: computer and information research specialization, computer systems analysis, software development: applications, software development: systems, and software engineering. The curriculum consists of 124 semester hours that include 24 hours of core courses. Tuition costs $511 per credit hour and financial aid is available in the form of federal grants, loans and scholarships.